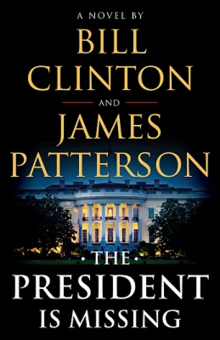 The President is Missing by President Bill Clinton and James Patterson has been available in Hardback since 4 Jun 2018. Well – What can I say…. When could you read a political thriller about the US Presidency by a former US President and one of the worlds foremost writers? Now!!! Whether you like it or not….it’s certainly a MUST READ! It’s incredible and utterly enthralling and was always sure to give a heavy dose of authenticity to this novel. James Patterson is one of the most famous writers ever, with worldwide sales of over 375 million. The corridors of Washington are awash with intrigue and fear as an imminent attack of huge proportions is expected to occur against the US, by its enemies. Concerns grow of a traitor within, with even the shadow of suspicion falling on the President himself, who then disappears. Reminiscent of the James Grady novel, Six Days of the Condor and the subsequent film Three Days of the Condor, the action in The President is Missing is also set over three days. Threatening cyber-attack viruses, a buxom Bosnian assassin, chronic illness, the threat of impeachment are some of the troubles on the recently widowed Presidents mind… and then there is the ‘Sons of Jihad’ to deal with, if that want enough! The destruction of America as a global super-power, is the end game. The President is Missing by President Bill Clinton and James Patterson is a true epic and an exciting read and is well worth it!